Parking at the Three Shire Stone, which stands at the summit of Wrynose Pass, saves about a thousand feet of climbing and it pays to get there early as the road side parking spaces are very limited. We waited in the car for a good while in the hopes that the very low cloud would move, but it didn’t so we just had to get on with it. There was no point in taking pictures until we reached this point as we walked in fog and the views were non-existent. 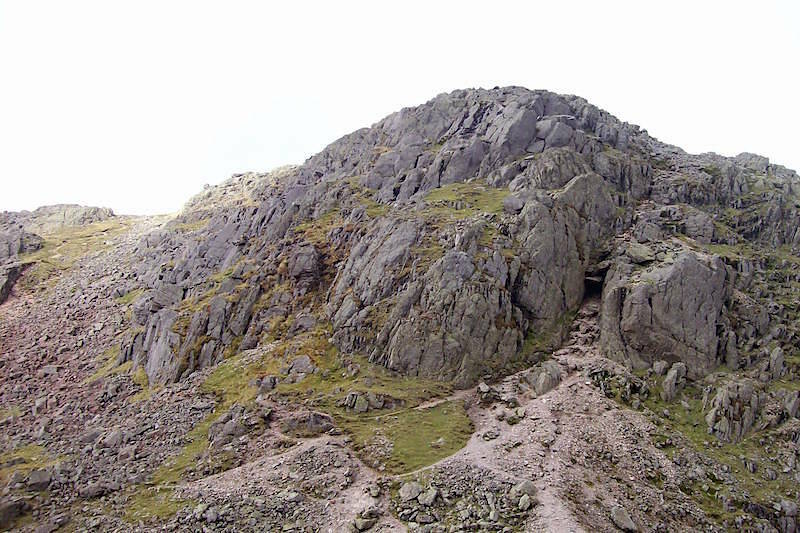 There’s not much of a view either from the first crinkle on Crinkle Crags but a brief gap in the cloud gave a fleeting glimpse of Eskdale. The cut on the nose, sustained on Slight Side the other day, is healing nicely. 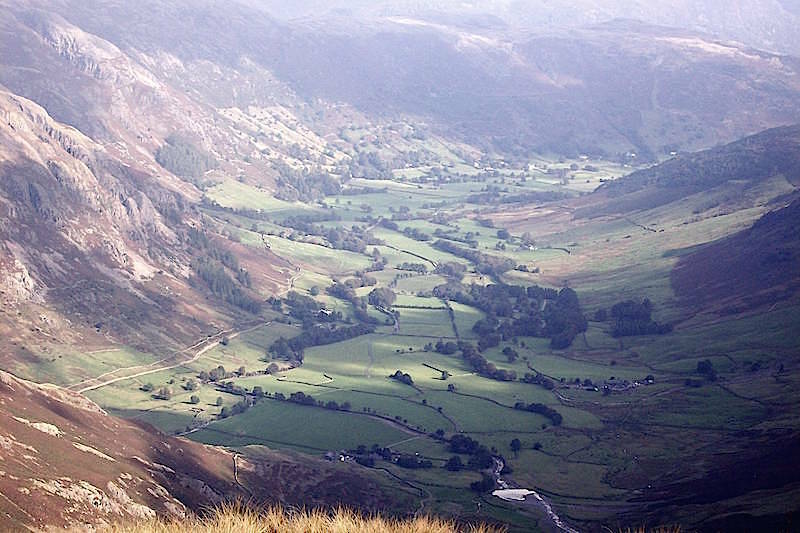 The view down into Great Langdale as the cloud breaks for a short while. 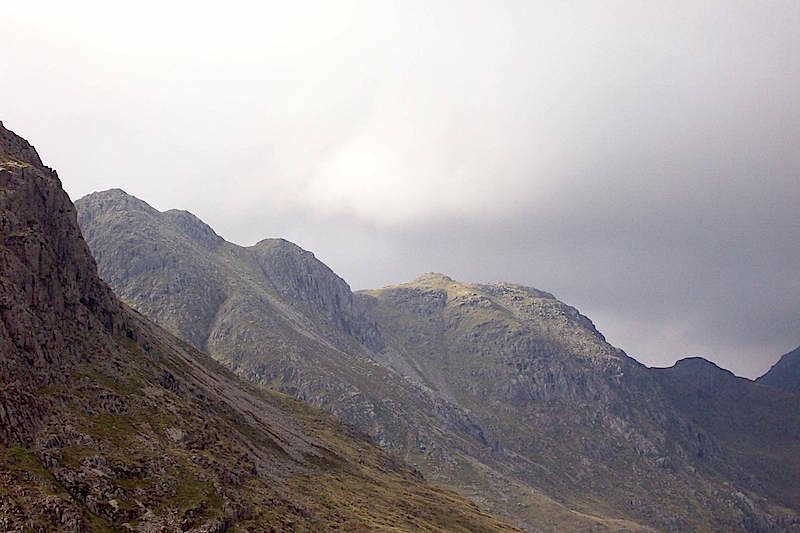 Approaching the second crinkle where there is the choice of routes, to the right, where the dark patch is, the ‘bad step’ which requires a bit of scrambling, to the left, a straightforward bypass round the rocky section and back over to the top. Not having a stepladder handy and being a bit short in the leg department its the bypass for me. 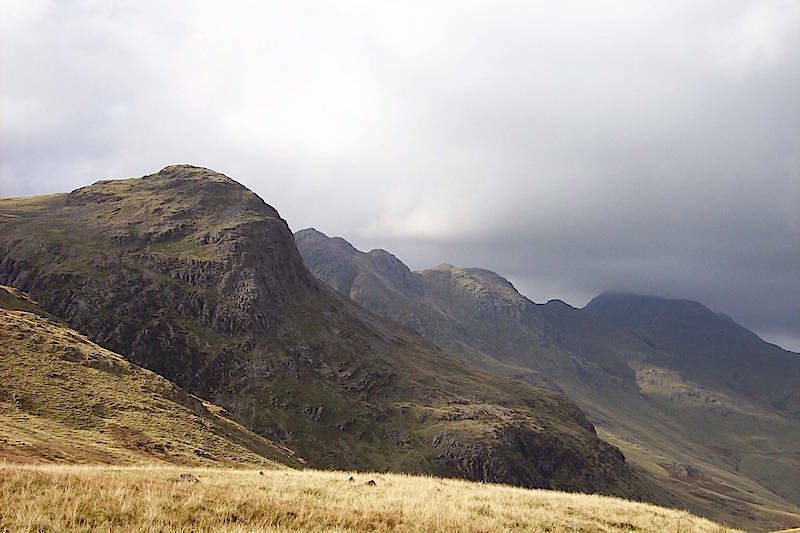 Another brief break in the cloud gives us a view down to Eskdale with the long northern slope of Hard Knott just below us. 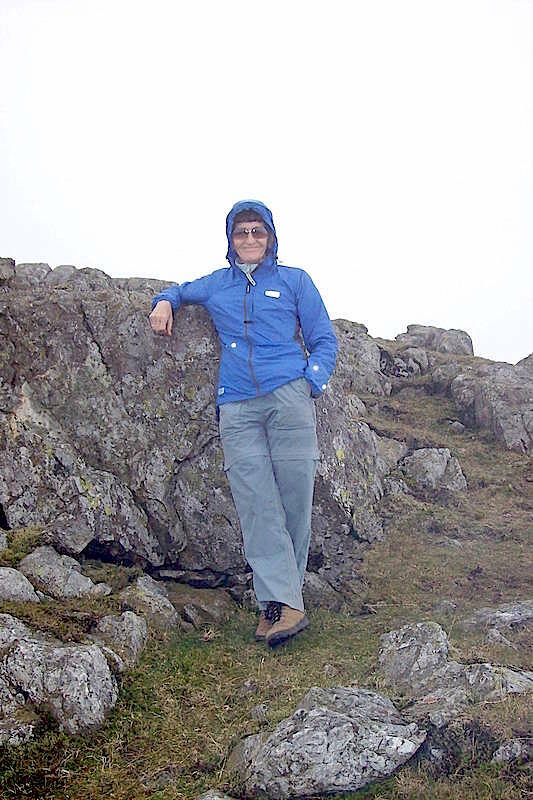 Didn’t need the sunglasses in all this cloud today so I took them off and put them down on top of the rocks to put the camera away. I put my rucksack back on and promptly walked off without the sunglasses. 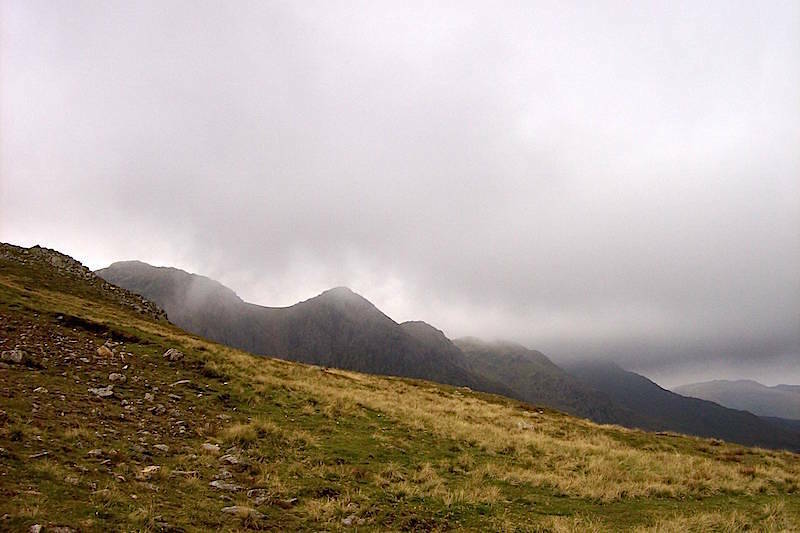 A misty Pike O’Blisco from the path across Crinkle Crags. The cloud continued coming and going all the way along which meant that views were very sporadic today. A look back on the return leg and the cloud continues to drift around. 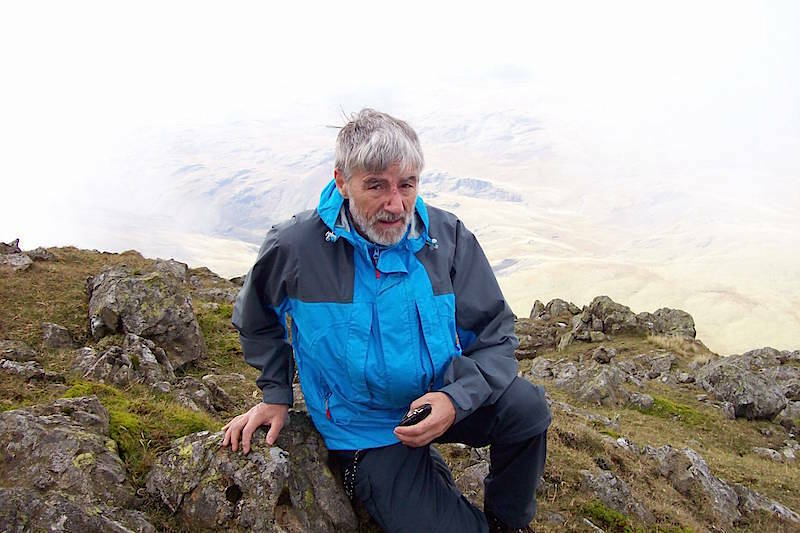 Looking ahead to Cold Pike and the cloud isn’t quite so bad in this direction. 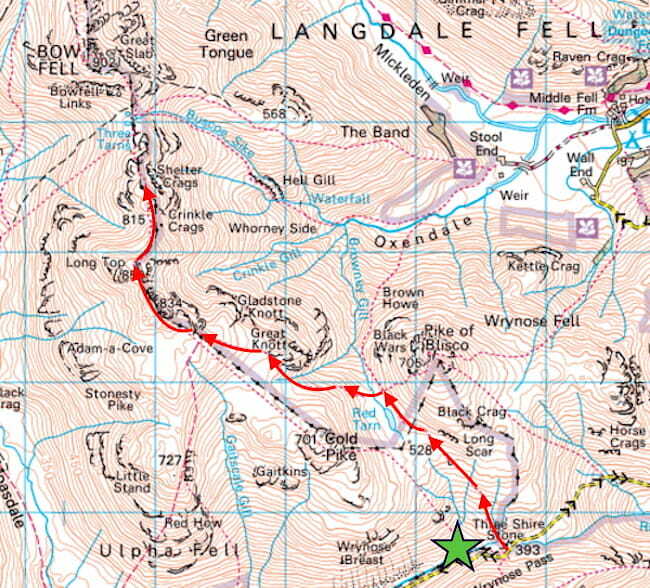 We didn’t go over to Cold Pike but continued on down the path towards Red Tarn. 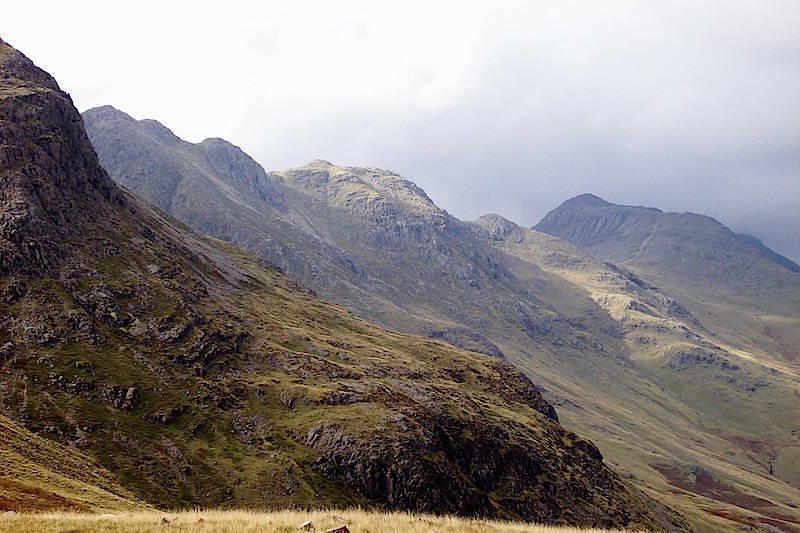 On the way down I took a look back for this slightly clearer view of Great Knott and Crinkle Crags. 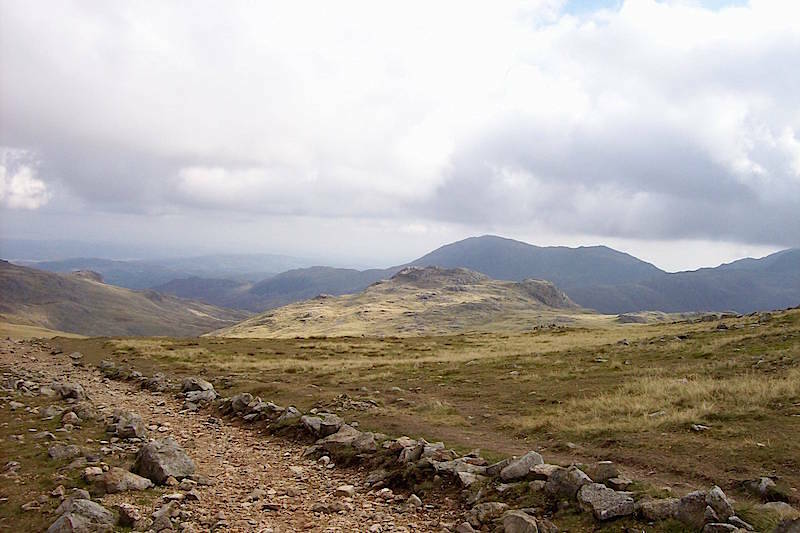 Bowfell over on the right is still cloud covered though. Finally, the cloud clears and a patch of sunlight lands on one of the crinkles. As is often the case, the cloud lifts and the sun breaks through just as you get near to the end of the walk. 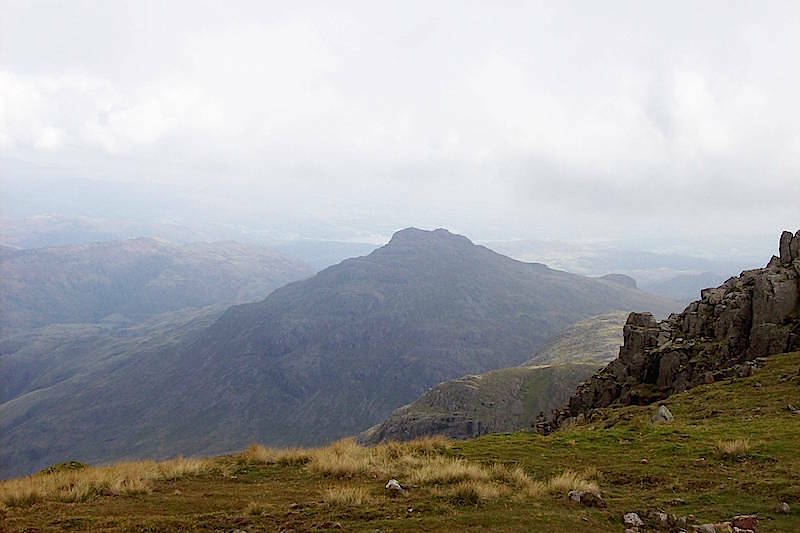 Crinkle Crags and Bowfell now completely cloud free so the views from up there will now be much better. Maybe we should have set off later. It was round about here that I realised that I had left my sunglasses behind, so it was a bit of an unsatisfactory day all round. 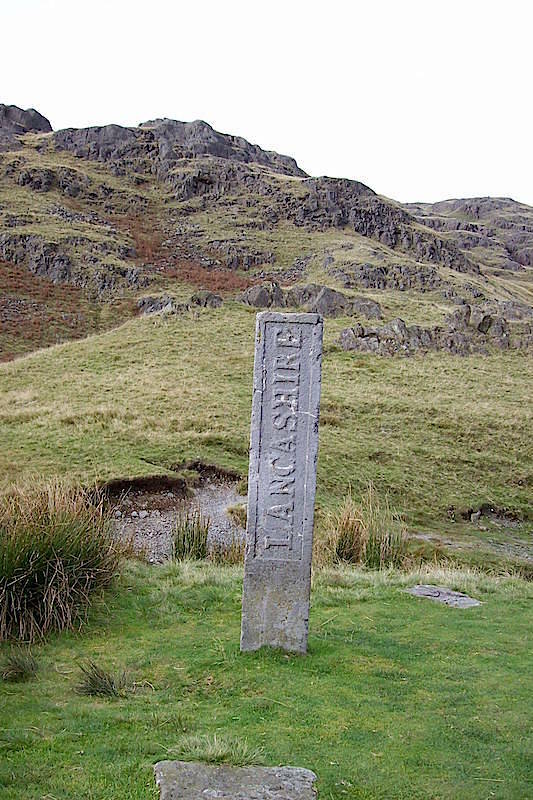 Three stones have traditionally marked the adjoining counties of Cumberland, Westmorland and Lancashire on this site. The limestone monolith carved in 1816 for the Furness Roadmaster William Field of Cartmel (D. 1860) was set up by friends after his death. Repaired and re-erected by the National Trust in 1998 with local support. 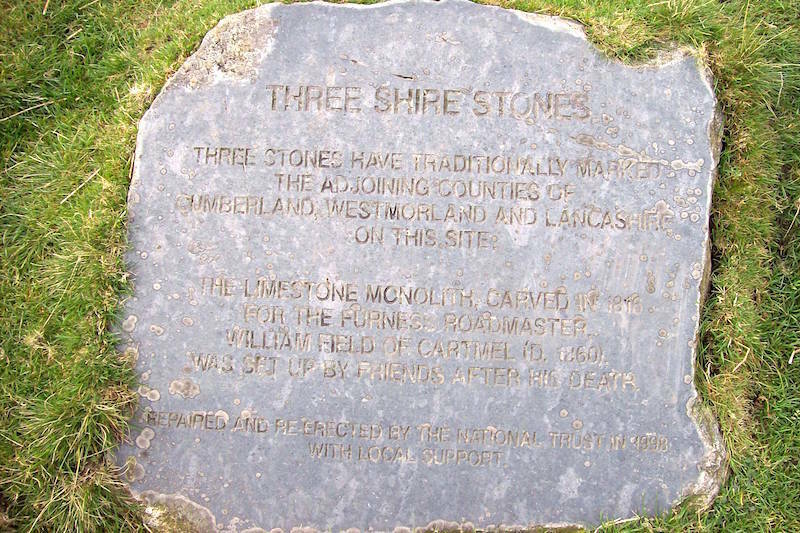 The Three Shire Stone, as it stands today ,at the summit of Wrynose Pass, 1289 feet above sea level. 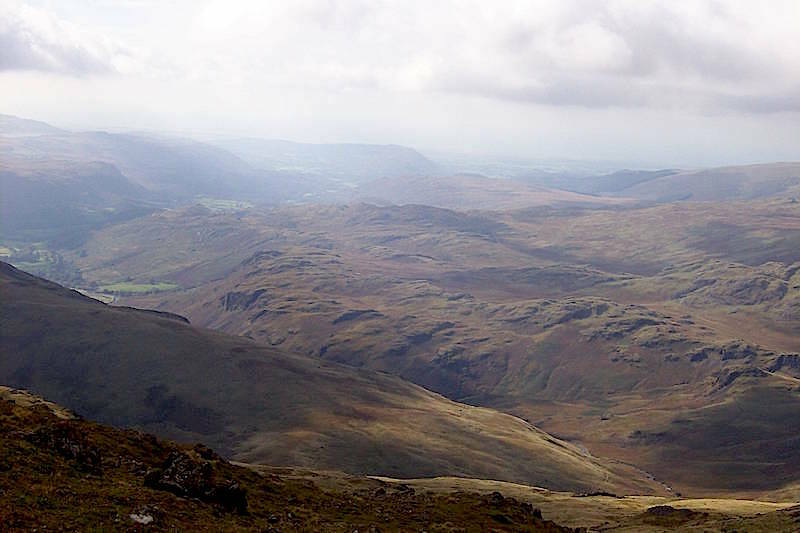 The counties of Cumberland and Westmorland, together with parts of Lancashire and Yorkshire, were combined in 1974 to form the new administrative county of Cumbria.